Facebook has finally released its own dedicated messaging app for Windows, letting you access all the Facebook updates you could possibly want from your desktop. See and respond to chats right from your desktop. Whether you’re browsing other websites or using another app, you don’t have to click away to stay connected. Find out about new comments, photo tags and more as soon as they happen. Installing the app is simple enough – download the FacebookMessengerSetup.exe file and install, input your log-in details and you’re away. By default, the program runs in a long, slender box which can either float around your screen or take up an entire vertical strip of your display. The Messenger interface serves up a Ticker-like stream of latest updates from your Facebook chums, showing tags, comments and more. A drop down notifications bar lets you see the important stuff, and clicking on a friend opens up a tabbed chat box. It’s all rather handy if you’re a Facebook fiend. 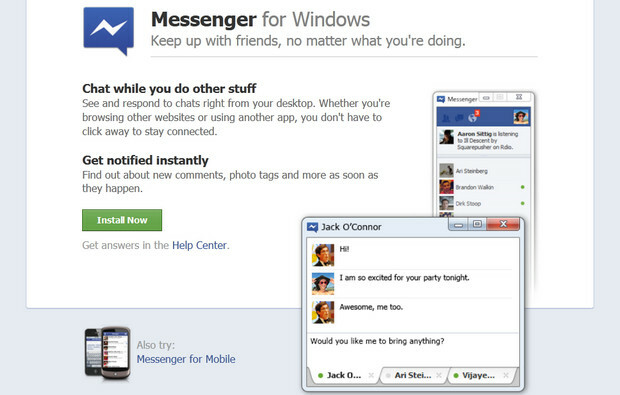 Facebook say that the Mac version is on its way.